Ten months after Skerries beat Banbridge with a last-minute converted try that went viral on YouTube, the two sides were again involved in a game of high drama. With three minutes injury time already played, Bann were pressing deep inside the home 22 for the score that would see them overhaul a two point deficit. When the referee signalled that Skerries had committed a penalty offence just to the right of the posts, Bann retained possession to continued the attack in the belief that they still had the comfort of a shot at the posts. But sometime during the course of two re-cycles and Bann moving the ball to the left flank, the match official decided that it was ‘advantage over’, so when Bann knocked on five metres out, Skerries were awarded a scrum. Bann were penalised at the set piece and Skerries kicked the ball out of play to signal the end of the game. It was a cruel end to a game in which Bann had fought back after going ten points down in the opening six minutes to take a five point lead ten minutes from the end. Skerries out-half James Faiva converted a third minute penalty and then added the extras to an excellent try from full-back Maurice McAuley after the home threequarters had found a gap in the wide channel. Jonny Little’s half break off a lineout gave Bann the attacking base to allow the pack to drive flanker Dale Carson over for Bann’s opening score, with Adam Doherty converting. But the home side struck back in the 15th minute, using the strength of a well-drilled forward unit to put Ross McAuley over from a lineout and maul, with Faiva again on target with a testing kick off the tee to take the score to 17-7. Midway through the first half, Stephen Irvine crossed for Bann’s second try as he took advantage of a quickly-taken penalty close to the home line, with Doherty’s conversion attempt from the touchline falling short. Peter Cromie’s neat dummy and feed to Doherty put Bann in another strong attacking position but Skerries did well to win turnover ball for temporary relief. But after Carson had set up quick midfield ruck ball, Doherty won the race to Andrew Morrison’s grubber into the in-goal, before adding the extras for a 17-19 lead. Carson’s strong tackle saved a try but when Bann were penalised soon after for not releasing, Faiva struck over his fourth successful kick to edge his side in front. And by the interval that lead had been stretched to 25-19, with flanker Thomas O’Hare proving unstoppable from a ruck close to the line. 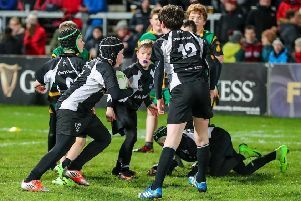 If the second half produced fewer points, it was no less exciting as both sides showed a willingness to take advantage of the perfect conditions for attacking rugby. Yellow cards for Chris Allen and Peter Cromie at the start of the second half forced Bann to play for five minutes with 13 men, but they still managed to win a penalty which Doherty converted from 40 metres. In the 65th minute Bann’s strong scrummaging won them a penalty from which they set up an attacking line-out. Irvine went close before Shandon Scott put winger Clark McAllister in for the bonus point try. And when Scott slotted over a penalty from 26 metres it looked odds on for an away win. But Skerries regained possession from the re-start and replacement prop Cormac Marrey finished off after his co-forwards had pummelled at Bann’s line. That tied the scores and Faiva’s successful conversion proved to be the winning act of an excellent game, albeit one that left the visitors feeling hard done by. Bann’s Assistant Coach Robert Ervine said: “It’s very hard to lose like that. “The ref clearly indicated she was playing advantage and that’s what we were playing to.